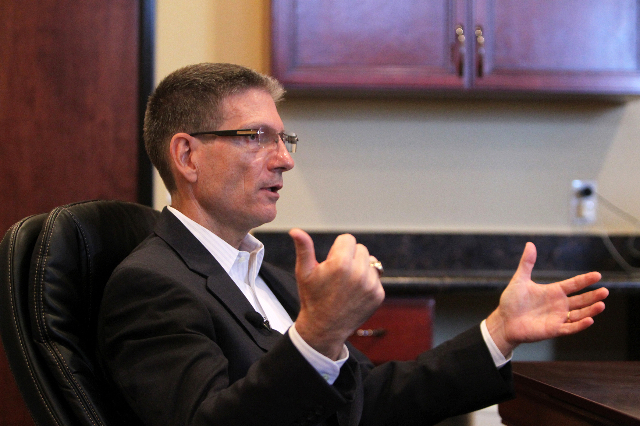 U.S. Rep. Joe Heck said Thursday that birthright citizenship should be on the table in the broader dialogue about immigration reform. The 3rd Congressional District Republican made the comment to reporters after speaking at a breakfast sponsored by the Las Vegas Metro Chamber of Commerce. The event drew about 200 people to the Vdara. Heck is seeking his party’s nomination for the Senate seat of Harry Reid, D-Nev., who is not seeking re-election in 2016. Former Nevada Attorney General Catherine Cortez Masto is seeking the Democratic nomination and has Reid’s support. The race is shaping up under a broader national backdrop, the discussion of immigration reform that has dominated the presidential race. Republican front-runner Donald Trump, for example, has gained widespread attention by calling for the end of the birthright citizenship provision in the 14th Amendment of the U.S. Constitution. That provision gives citizenship to infants born in the U.S. even if their parents are in the country illegally. Heck was noncommittal about whether birthright citizenship should change. Heck said the immigration discussion should include other components such as border security, e-verify and a path to legalization for citizenship. “Everything that everybody wants to talk about regarding immigration should be on the table so that we can come up with an answer that hopefully will put the question to rest … about an immigration system that works for everybody,” Heck said. Asked about Trump, Heck said “I don’t talk about Donald,” adding that he’s focused on his district. Heck took questions from the audience. Asked about Yucca Mountain and its role as a repository for high-level nuclear waste, Heck said the Nuclear Regulatory Commission hasn’t yet made a final decision on whether it’s safe or not safe. “The goal for me is to make sure that the safety and security of Nevadans is protected regardless of what the decision is,” Heck said. Asked about the Interstate 11 project, Heck said the big issue is funding. The project would provide a freeway between Las Vegas and Phoenix, and eventually extend between Mexico and Canada. He said he wants to see a change that would allow large companies that buy infrastructure bonds an added incentive of being able to repatriate their money tax-free. That would allow them to relocate funds back into the U.S. from other countries.